A cautionary tale of Cyril Paxton -- a gambler who has lost his last bet. 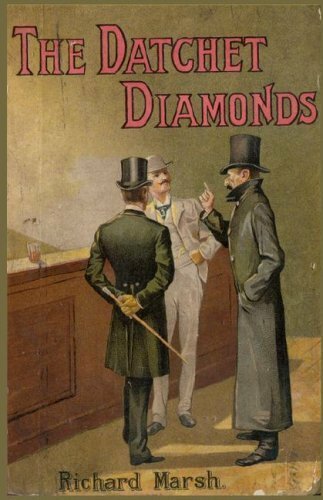 Accidentally finding himself with of a quarter million pounds worth of stolen diamonds, the story quickly leads to his involvement with Scotland Yard's finest. 'If Christ were to come again to London, in this present year of grace, how would He be received, and what would happen?' 'I will try to show you,' replied the Scribe. These following pages represent the Scribe's attempt to achieve the impossible. Famed dark novelist Richard Marsh collections a series of stories that are interlinked, dark, mysterious yet with an air of romance. Reviewed by some as folly and others as pure genius. Exciting and fast paced, this is an easy book to read through. by Richard Marsh - Methuen & Co. The stories feature an eclectic mix of humour, crime, romance and the occult. Contents: The long Arm of Coincidence; The Mask; An Experience; Pourquoipas; By Suggestion; A Silent Witness; To be used against him; The Words of a Little Child; etc.